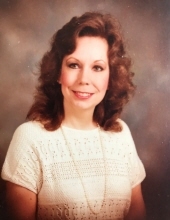 Sandra Sue Mansfield was born September 8, 1944 and passed away November 30, 2018. Grandchildren Robbie Patrick West, Andrew Thomas West, June Santina West, Owen David Winter, Aviva Bess Rigberg, Reese Charlotte Winter, and Elle Frances Rigberg; many wonderful Cousins, Nieces, and Nephews; her Poodle Daisy. Graduated from Sam Houston High School June 01, 1962. Retired from Bank of America on 08/28 2003 after 25 years as Loan Agreement Compliance Specialist. Sandra was preceded in death by both parents Walter Lee Sawyer and Hazel Nell Berry and by her brother Rowan Gregg Sawyer. Sandra was known by her grandchildren as Nana Sandy and she loved them all very much. Sandra was an avid reader and could not collect enough books. She was proud that she had read over 700 books on her Kindle. She loved using her Apple lap top, iPad, and iPhone. She enjoyed taking and sharing photos for the web site Flicker. She loved to travel and we went to Paris (three times); Trier, Germany; Aberdeen, Scotland; Maui, Hawaii; Carmel, California; San Francisco, California; Seattle, Washington; Vancouver, Canada. Sandra loved the clouds and would always say how beautiful they were. She touched the lives of her Family and Friends. She was an organ donor, the first one at Houston Methodist Hospital The Woodlands, through Life Gift Texas. Baby I will miss you so much and you will forever stay in my heart. Love you always, your husband. To send flowers or a remembrance gift to the family of Sandra Sue Mansfield, please visit our Tribute Store. "Email Address" would like to share the life celebration of Sandra Sue Mansfield. Click on the "link" to go to share a favorite memory or leave a condolence message for the family.